“I fix all the blame of these extraordinary proceedings upon the Presbyterians.” So one colonist loyal to King George wrote to friends in England. The parson of which he spoke, was John Witherspoon—a Presbyterian minister, as well as a descendant of John Knox. At the time, Witherspoon was president of the College of New Jersey (now Princeton). He was also the only clergyman to sign the Declaration of Independence. 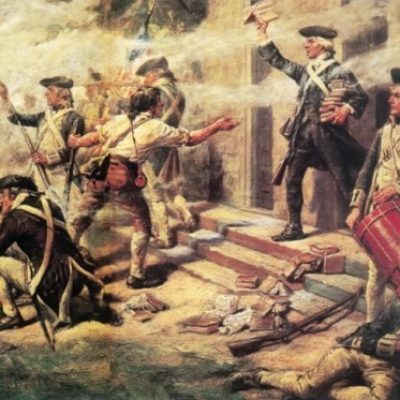 Most American Christians are unaware of the fact that the American Revolution, as well as the new American state, was greatly shaped by Presbyterians and the Calvinism that was at its root. Some modern-day Presbyterians have moved light years away from the convictions of these early colonists. To the man, Presbyterian clergy joined the Colonialist cause. It was said that many of them led the Revolution from the pulpit. In doing so, they paid a heavy price for their support for independence. Many lost family members or their own lives. Some had their churches burned to the ground. We forget that many of the early American colonists had left England precisely because Presbyterian Christianity was rejected. After its brief reign as the established church through the English Civil War and the work of the Westminster Assembly, Britain returned to Anglicanism. Thousands of non-conforming Presbyterian ministers were then ejected from their churches. Some, such as the Covenanters, were martyred in a period that came to be known as “the killing times.” Rigid laws of conformity drove many to seek a better life somewhere else. After 1660, many Presbyterians began to make their way to the colonies in North America. It was these individuals who brought a new strength to the colonies as they inched their way forward towards independence. They had little loyalty, and often outright hostility, to the crown of England. They were armed with the theology of John Calvin, mediated through John Knox, and solidified during the English Civil war. It was a theology which devalued the divine right of human kings, and elevated the worth and dignity of the individual under God. This theology shaped the early American understanding of civil liberty. It shaped our founding fathers. The idea of human equality which influenced John Locke, who in turn, influenced our founding fathers, was learned from the Puritans. Locke’s father had been on Cromwell’s side during the English Civil war. It also shaped the general population under the influence of the Great Awakening. The Great Awakening was a massive 18th century religious revival that shook the colonies. It was promoted by preachers such as Gilbert Tennent and George Whitfield who travelled up and down the coast calling for a return to a robust Christian and Biblical faith. 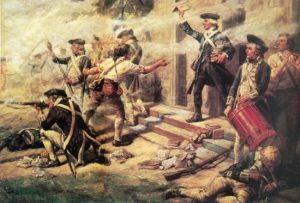 Emphasizing the new birth and a Calvinist theology, the Great Awakening had an immense influence on colonial sentiments in the generation just preceding the American Revolution. Consider then, some of what was at work in the American consciousness preceding the revolution. There was the memory of their horrid experience in England. There was the worry that Anglicans would establish this same kind of church in the colonies. There was a persistent fear of the imposition of bishops who were viewed as “holy monarchs,” (monarchy in any form was considered bad)! There was a belief in the absolute sovereignty of God. God alone is Lord of all and the author of liberty. There was a corresponding belief in the absolute equality of individuals (king and peasant, clergy and laity) under God’s law. There was the belief that no human should be entrusted with absolute power, given our radically fallen human nature. There was a belief that there should be a separation of powers in any new government that is established. And because of their experience in England, there was the belief that religious freedom and freedom of conscience should be respected. In other words, for these Presbyterians, liberty is affirmed, but it is not an absolute liberty. It is always to be lived out under the sovereign creator God. It was this theology, a theology rooted, not just in Calvin, but in the Bible, which ultimately gave the colonialist the will to resist. So this year, as we celebrate our independence once again, and as we think of early American courage, and the genius of our founding fathers, let us not forget those blasted Presbyterians who sought to understand liberty in light of the Bible. A liberty which conceived of a nation and its entire government under God.